Stockades are walls or fences. There were three different stockades at Aztalan, one around the exterior, one surrounding the plaza, and one enclosing the residential portion of the site. The external stockade contained bastions, or watchtowers, at evenly-spaced intervals. Entrances to the site itself were cleverly constructed. For example, although the wall looks solid, there is a set of overlapping walls at one entrance to the plaza near the southwest mound. The opening is screened from view, and you enter through a narrow, protected passageway. To build the stockade, posts were set in the ground. Willow branches were woven through the posts and the whole stockade was plastered with clay mixed with grasses. There are various theories about the stockade's function. People built stockades for many reasons: to keep people out, to keep people in, and/or to control the number and type of people who enter and exit. The first exterior stockade was rebuilt; the second one burned, but we do not know if this was deliberate or accidental. Likely stockade construction technique; plants and grasses are mixed with mud to form a plaster over the large individual posts. 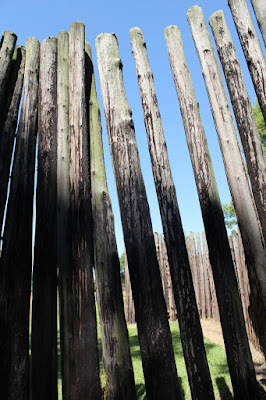 Inside the stockade . . .